Hurtling down Chui Prospekt in Bishkek, Kyrgyzstan, my taxi driver points to a towering figure fitted in battle attire mounted atop a galloping horse. “Manas,” he explains, language barriers preventing further discussion. Manas is a national hero for the Kyrgyz people, a half legend, half factual figure whose exploits have been detailed in an epic poem to match Homer’s The Iliad. He stands as a symbol for national unity and patriotism. Almost simultaneously the taxi driver raises the volume of the radio several decibels, excited as a local Kyrgyz artist floats along the airwaves. When asked what the song is about the inevitable answer of “love” follows. Love and Manas, it is an appropriate introduction to the incredibly beautiful country of Kyrgyzstan, its stunning landscape and intriguing breakaway from Soviet rule only upstaged by the warm and hospitable locals and their semi-nomadic culture. The beauty of Bishkek is not immediately discernible when arriving in the city, but it does not take long for its character to shine through as the summer sun beats down on Soviet pavements. 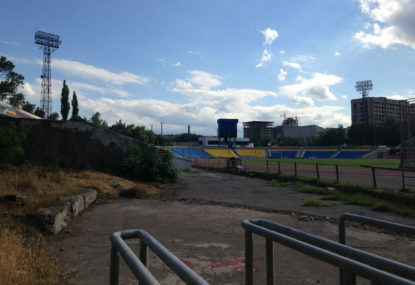 About a kilometre east from the impressive statue of Manas lies Spartak Stadium, or Dolen Omurzakov Stadium, host of the Socceroos’ first obstacle towards qualification for Russia 2018. It’s in a dilapidated state but the Football Federation of the Kyrgyz Republic has worked hard to improve the facilities with limited notice, including installing new flood lights. Spartak Stadium’s shadow encompasses the Panfilov Park, where children can be heard squealing in delight at a mini fun park. Head east for a relaxing stroll and you will find a statue of Stalin pointing towards a forgotten future. While Australian fans could be excused for approaching the match with an air of formality – not expecting too much resistance but wary of a potential banana peel – the Kyrgyz are confidently looking forward to the challenge. Whether naïve or not, the Socceroos have not yet made such an impression on world football that they are considered unbeatable to a relative minnow of Asian football. Four hours south-east of Bishkek in the village of Bokonbaevo – which makes up for its less than appealing aesthetic attributes with an amazing backdrop of the Teskey Ala-Too mountain range and lake Issyk Kul – the locals are not convinced that this will be an easy ride for the Australians. Perhaps harking back to the spirit of Manas, it is an indication of the Kyrgyz’s pride and belief in their nation of less than six million people. Adilet, an English teacher and tourism entrepreneur with upcoming company Max Pleasure Tour, says there is a lot of excitement around the match, especially among his football-playing students. “Football and wrestling are the big sports in Kyrgyzstan,” Adilet says. More akin to customs of the Qatari national side, African players are being lured to Kyrgyzstan with the supposed promise of a pathway into the Russian Premier League. Yet some of them have become nationalised Kyrgyz and gone on to represent the national side, such as Ghanaian-born defensive midfielder Daniel Tagoe and forward David Tetteh. The country’s best talent, however, is still prone to being poached from the richer Kazakh and Uzbek clubs circling for bargains. Before Soviet rule Central Asia was not separated by borders, however Russian intervention soon redrew the maps. While Kazakhstan and Uzbekistan found themselves with rich reserves of oil and gas, the Kyrgyz were left with water and livestock. As a result times have been tough since Kyrgyzstan reluctantly took up independence following the collapse of the Soviet Union in 1991, and peace has sometimes been marred with violent revolutions, the most recent in 2010. But that has not diminished the Kyrgyz’s incredible hospitality. Old men approach you on the street offering cigarettes and a yarn, younger Kyrgyz often invite you for vodka while on a night out and even when trekking in the mountains the locals are quick to supply food and water before sending you back out into the wilderness. Old customs have not been lost. It is a wonder why more tourists do not visit the country, though the small bunch of journalists and supporters making the trip over for the Socceroos should head home with positive reports. 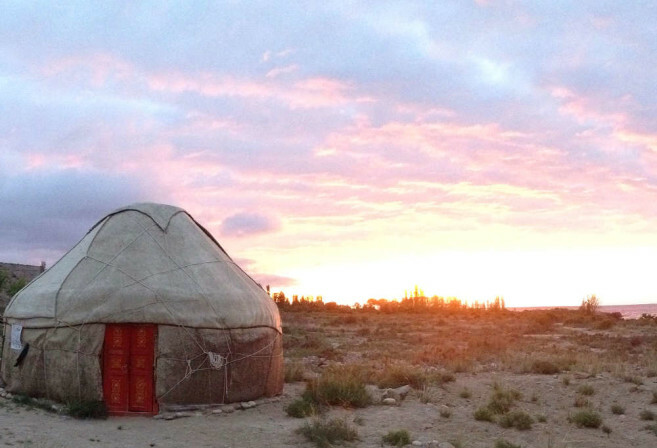 In a nation where a semi-nomadic lifestyle is still existent – shepherds live in yurts during the warmer summer months – and one which is battling the transition of leaving Soviet rule, football has understandably suffered. In the local league, where Dordoi Bishkek have won nine from the past eleven championships, it is rare to see more than a couple of hundred fans occupy stadiums at some games, according to old football fan Ishen Obolbekovs. On Tuesday, however, Ishen expects Spartak Stadium will be a sell-out, describing the match against the Socceroos as the biggest sporting event in recent history. “Last time I was there for an international game we had full. For sure it will be the same,” he says. “When I first heard of the game, I said ‘we are the winners’. No matter what. Ishen has also been impressed with the commitment and organisation from the Football Federation of the Kyrgyz Republic in promoting the game and assisting the team’s preparations, indicating how much the Socceroos’ visit means for football in Kyrgyzstan. He feels Australia’s visit could provide the necessary boost to bring football back to the popularity levels existent in the 1980s. “Our team is travelling to [Dubai] to have training courses, which means somebody is organising this. We are working for the result and there is big interest. This is strange,” Ishen says. “There is much advertisement. They send SMS on our mobile phones to tell everyone to come and support our national team. Last Thursday, Kyrgyzstan kickstarted their World Cup qualifying campaign with a trip to Bangladesh, where they secured a dominant 3-1 victory in what was incredibly their first match of 2015. The hosts were slight favourites and in a pre-game presser the Bangladesh coach dubbed the Kyrgyz as a long ball team that relied on physical attributes often associated with former Soviet nations. Yet much like their close neighbours the Uzbeks, Kyrgyzstan shut down those generalisations with a high pressing game, forcing the Bangladeshis into a number of early errors. Serbian-based attacker Anton Zemlyanukhin scored an impressive brace, the first an inch-perfect curling free kick and the second a long-range bullet, while Polish-based Edgar Bernhardt slotted home a penalty. If the Socceroos had been harbouring even a glimmer of arrogance they will certainly have flushed it out after reviewing the Kyrgyz’s performance, though an upset is still unlikely. While World Cup qualification is just a simple pipe dream for Kyrgyzstan, a place in the Asian Cup is within the country’s grasp, and would symbolise a massive achievement for the entire population. On paper, Australia should prove too strong for the Kyrgyz, and three points to open the Socceroos’ bid for Russia 2018 is the predicted outcome. Yet if the determination and belief prevalent in the locals is matched by the 11 footballers out on the pitch it will not be an entirely smooth ride for the Socceroos. “The ball is round,” says Ishen.